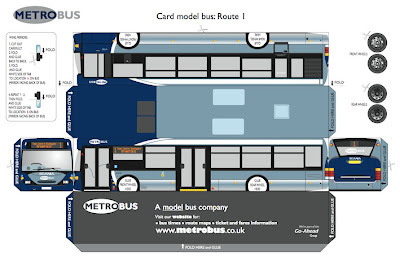 Well, maybe that headline is a *slight* exaggeration... What’s actually on offer is pretty sweet though: four downloadable pdf files of buses (single- and double-decker designs) that are used on the routes of UK operator, Metrobus. The Metrobus network covers swathes of South London and surrounds, including the two major airports Heathrow and Gatwick, so if you ever travel in those parts you’re likely to see the Metrobus fleet in action. To non-UK readers, double-deckers can often seem rather exotic creatures, so the Omnidekka should be of interest. It’s nicely drawn by The Image Team, and is designed to be printed off on a colour inkjet or laser machine. Full instructions are given on the sheet, so with some cutting, folding and glueing, you should end up with a smart little card model. If you print out on ordinary typing paper, then use spraymount adhesive to stick the result onto thin card before assembly. Or if there's no suitable printer available, we often use a local print/copy company that supplies images on a very nice smooth cartridge for about the same price as a daily newspaper - value indeed. Scale isn’t an issue with pdfs of course - if you want your model bigger or smaller, simply dial in the percentage enlargement or reduction to get a resized printout, ready to assemble. 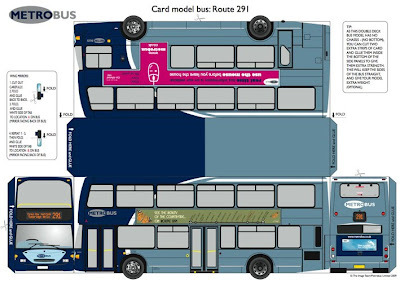 Good luck with these free buses - SMN will be making a couple this week, to see how they look. 1 Single-decker bus Route 1. 2 Double-decker bus Route 291. For a selection of diecast buses, visit Amazon here.